VietNamNet Bridge - The forests in the Central Highlands continue to be cut down though they were closed more than a year ago as ordered by PM Nguyen Xuan Phuc. Many deforestation cases still occur in front of local authorities. The serious deforestation has once again become a hot topic for NA Deputy discussions. “PM ordered forest closure, but the forests have not been closed,” said Nguyen Sy Cuong, a NA Deputy from Ninh Thuan province. “The large-scale deforestation cases in some localities recently showed that the PM’s order has been ignored,” he said. The director of a forest planting company, who Cuong met in a business trip, said that illegal loggers had been lent a hand by local authorities. “If local authorities and forest rangers did not support them, illegal loggers will never be able to carry out such large-scale deforestation cases,” he said. 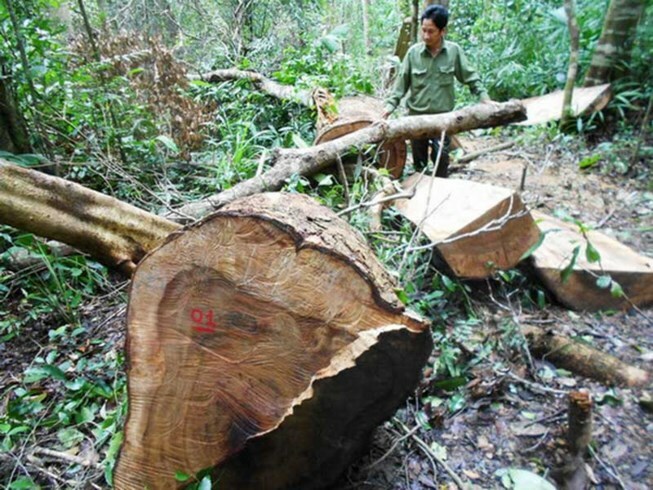 Cuong said the director had said that illegal loggers just need 16 minutes to fell a 100-year old tree and must pay VND400,000 to every forest ranger station to bring wood out of forests. “If local leaders only turn up at sites after the forest is destroyed and they don’t have to take responsibility for deforestation, I wonder when the PM’s order on forest closure will be enforced,” he said. The forests in the Central Highlands continue to be cut down though they were closed more than a year ago as ordered by PM Nguyen Xuan Phuc. The increasingly serious forest devastation is also a concern of Duong Xuan Hoa, a NA deputy from Lang Son province. He cited a report of the NA’s Legal Committee as saying that the deforestation in many localities have had serious impacts on the environment and affirmed this is a major reason behind the serious floods recently. Hoa commented that in many cases, illegal loggers had felled trees for several consecutive months, but local authorities only discovered the deforestation when the forests became bare. Ksor Phuoc Ha, a deputy from Gia Lai province, confirmed that the forests in Central Highlands have been seriously devastated. “Regarding the Central Highlands, one would think of large green forests, vast prairies, mysterious mist and mineral resources. However, the large green forests are being destroyed,” she said. “In 2016, the Prime Minister ordered forest closure. In 2017, the lost forests in the Central Highlands increased by 50 percent compared with 2016. Is this a paradox or a challenging message?” she asked. The Ministry of Agriculture & Rural Development (MARD), at an online conference on strengthening measures to develop forests several days ago, reported that the forest area in the Central Highlands had decreased by 3,170 hectares in comparison with 2015 to 2,558,646 hectares. In the latest news, the Binh Dinh provincial authorities have discovered that 15,745 hectares of forests in Canh commune of Van Canh district have been eliminated.